Sign up today to get weekly updates and alerts from Oceana. One of the most delicious ways for diners to sample the fruits of the Chesapeake Bay is by eating a Maryland crab cake. The iconic blue crab is the official Maryland state crustacean and a prized catch in the Chesapeake region. The blue crab, popular with many locals and tourists, also underpins the most profitable fishery in Maryland and the Chesapeake Bay, supporting the livelihoods of thousands of local fishermen and seafood businesses. Unfortunately, Oceana’s new seafood fraud investigation has found that even Maryland’s favorite seafood dish is not safe from a bait and switch. When diners are expecting the fresh, distinctive flavor of the Chesapeake blue crab, they may instead be served a completely different species, shipped from as far away as Indonesia. 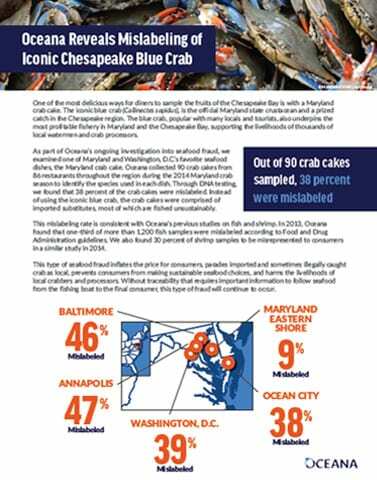 Oceana’s new report found that 38 percent of the crab cakes sold as locally sourced blue crab, instead contained imported species, most of which are fished unsustainably. This mislabeling rate is consistent with Oceana’s previous studies on fish and shrimp. In 2013, Oceana found that one-third of more than 1,200 fish samples were mislabeled according to Food and Drug Administration guidelines. We also found 30 percent of shrimp samples to be misrepresented to consumers in a similar study in 2014. Seafood fraud encompasses any illegal activity that misrepresents the seafood you purchase, including mislabeling and falsifying documents or adding too much ice to packaging. The species substitution of crab uncovered here inflates the price for consumers, parades imported and sometimes illegally caught crab as local, prevents consumers from making sustainable seafood choices, and harms the livelihoods of local fishermen and seafood businesses. Without traceability that tracks seafood from the fishing boat to the final consumer, this type of fraud will continue to occur. Key information such as the species name, and where, when and how the crab was caught should follow the product throughout the supply chain. Requiring more transparency and full chain traceability will help to ensure that all seafood sold in the United States is safe, legally caught and honestly labeled. Photos and b-roll available upon request. Please contact Dustin and Amelia.